Jason Kelce prepped at Cleveland Heights High School, where he was a two-time All-Lake Erie-Lake League. Before he was drafted by the Philadelphia Eagles as the 191st overall pick in the sixth round of the 2011 NFL Draft, Kelce had a productive college career at Cincinnati with an Honorable Mention All-America and a second-team All-Big East titles to show for it. He is currently in his 7th season with the Eagles and is a two-time Pro-Bowler, a Super Bowl champion, and a 2017 First Team All-Pro. Learn more about the center player in the sub-headings below. Kelce is a native of Ohio and was born in Cleveland Heights; a city in Cuyahoga County of the state, on the 5th day of November 1987. His parents are Ed and Donna Kelce. His dad works in a steel company as a sales rep and his mom is a banker. His kicked off his football career at Cleveland Heights High School and was a two-time All-Lake Erie-Lake League. While with his high school football team, Jason played as a linebacker and a running back. Football wasn’t the only thing Kelce was in love with in high school as he also loved music and played the baritone saxophone with the school’s Symphonic and Jazz Bands. After high school, he played college football at the University of Cincinnati. He initially played as a fullback before switching over to the defensive position at the expiration of his redshirt period. He aided the Bearcats’ win over Southern Mississippi at the PapaJohns.com Bowl in 2009. In that same year, he started thirteen games at left guard and would later be named the second-team All-Big East honors. During his senior season, he played as a center under coach Butch Jones starting a total of 38 games – 26 as a left guard and 12 as a center. At the end of the season, he received both the Honorable Mention All-America and second-team All-Big East. Jason Kelce was projected a 4th to 5th round pick. He was at the NFL Scouting Combine and recorded the fastest forty-yard time of 4.89-second time of all offensive linemen. After the combine, he was diagnosed with appendicitis and had to undergo an appendectomy. The Philadelphia Eagles selected Kelce as the 191st overall pick in the sixth round of the 2011 NFL Draft, he, however, had to wait until the 2011 NFL lockout to be lifted before the deal was made official. His rookie season started and ended on a good note. 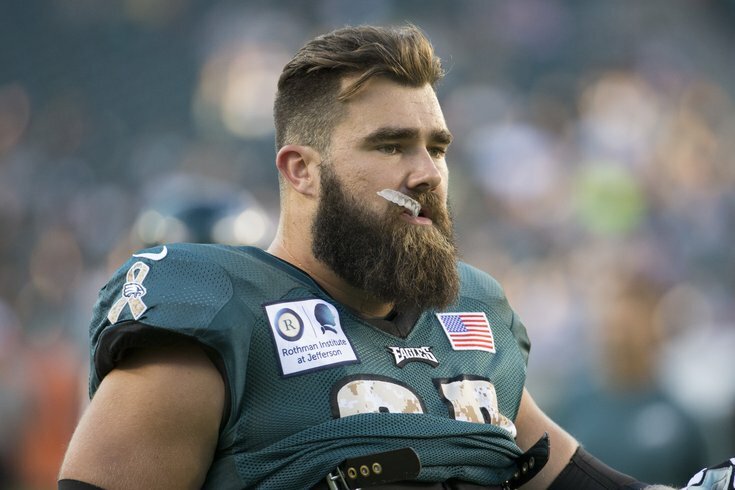 As a rookie, Jason Kelce started all of the games and was the first rookie player in the history of the franchise to start all of the season’s games. During his second season with the team, he was named the starting center for the second time in a row. The season, however, didn’t end well as he suffered a partially torn MCL and ACL which kept him on the bench for the rest of the season. But he made up for the loss the following season, starting all of the team’s sixteen games, helping them not just to reach the playoffs, but also to record a team-record of 442 points but with a 6,676 yards records. That performance earned him the title as the best center in the NFL that year and Pro Football Focus’ (PFF) honored him for that. He also bagged the Ed Block Courage Award. In 2014, he signed a 6-years contract with the franchise worth $37.5 million, inclusive of $13 million as guaranteed money. Despite missing four games that season due to a surgery, he still earned his first ticket to the 2015 Pro Bowl. The next season, he started all of the team’s sixteen games and earned himself a place among the top ten centres in the league as well as his second Pro Bowl. In 2017, he also started all games. He was named the highest offensive lineman by PFF and was also named First-team All-Pro. He won the Super Bowl LII with the Philadelphia Eagles and was named Run Blocker of the Year by PFF. Kelce is happily married. He walked down the aisle with his longtime girlfriend Kylie McDevitt in April 2018 at Logan Hotel in Center City in the company of close friends and family members. The NFL player is not an only child. he has a younger named Travis Kelce, who is also a professional football player and currently plays for the Kansas City Chiefs as a tight end. The Eagles center stands at a height of 6 ft 3 in (1.91 m) and weighs 134 kg (295 lb). At the beginning of his NFL career, he was named among the players lacking “true NFL size”, but he soon proved it is not always about the size most times and we quite agree with him.